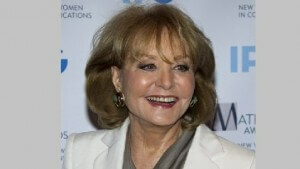 Barbara Walters took a fall this Saturday down a flight of stairs. She was visiting the residence of Britain’s ambassador of the United States, Peter Westmacott, after which she was hospitalized to treat a cut on her forehead. Though it seems she’s fine, the Washington D.C. hospital has given her a full examination and has kept her under observation. “Barbara is alert and telling everyone what to do, which we tall take as a very positive sign,” said ABC News Senior Vice President Jeffrey Schneider. Barbara was the first successful newswoman when in 1976 she earned a $1 million yearly salary. Over the last 30 years, she has given exclusive interviews to royalty and presidents. She was expected to cover Monday’s inauguration, in which President Barack Obama will amidst other formalities give his speech. The ABC network said that the hospital is keeping her out of an abundance of caution, but it seems that Walters will again be “fine” after a little more medical attention at the hospital. At 83-years-old she is still remains a vibrant newswoman.